After port placement, the ureter is dissected gently to prevent proximal migration of the stone. Usually, the calculus is large and can be easily dissected with blunt dissector or forceps in one port and an atraumatic clamp in the other. The ureter is held with a TABLE3 ■ Steps of Ureterolithotomy Babcock or atraumatic ring clamp above the stone and the periureteric tissue is cleared prior to incising. A longitudinal ureterotomy is performed using a laparoscopic knife or endoshears. Following stone retrieval, the ureterotomy is closed with interrupted, intracorporeal free hand suturing using 4/0-polyglactin suture. The stone is retrieved through one of the 10 mm ports. In our modified technique, we use just one 10 mm port and two or three 5 or 3 mm ports instead of all 10 mm ports used in the classic procedure. The 10 mm port is used for the laparoscope and the 5 or 3 mm ports are used for dissection, suction, and retraction. The operative steps of the procedure are the same as in the standard procedure. However, we do not place the stent priorly. After stone removal and temporary stone placement in the retroperitoneum, the ureterotomy is closed as described above. A 5 mm laparoscope is then passed through one of the 5 mm ports to locate the stone and grasping forceps passed through the primary port (camera-10 mm port) and intact stone is removed by pulling the stone along with the port. A 14-French JP drain is placed in the retroperitoneal space through the 5 mm port site. If the stone is in the lower ureter, an additional port is required medial to the anterior superior iliac spine for retraction. A 30° laparoscope is of great help in dissecting the lower end of ureter harboring the stone. 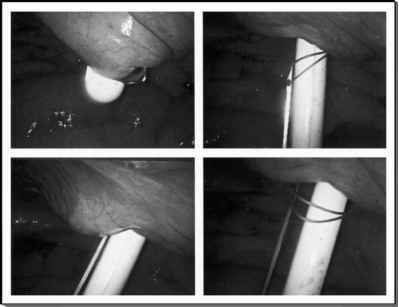 Two secondary ports are enough for retroperi-toneoscopic ureterolithotomy; however, a third port is needed in an obese patient for retracting the peritoneum and the retroperitoneal fat for intracorporeal suturing of ureterotomy site. We did not notice any increase in the duration of postoperative drainage in group of patients undergoing ureterolithotomy with modified technique without stenting.